That in itself was a real achievement for In Equilibrium at the company’s sixth conference which was a sell-out success. 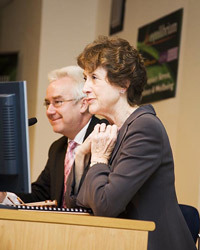 The conference attracted the UK’s top leaders in lifestyle management including Dame Carol Black, the UK National Director for Work & Health, whose recent review of the health of Britains working age population just received a response from the Government. Recognising that there is still a lot of progress to be achieved Dame Black said, “Relatively few line managers think they can refer employees to a GP, and they often do not have the confidence in GP assessments particularly with regards to stress”. However, wellbeing management is not simply about work related issues as Dr Robert Carr, Vice-President and Corporate Medical Director of GlaxoSmithKline highlighted, “We want our people to go home with enough energy to enjoy quality time with the people most important to them”. Other speakers included Emma Donaldson-Feilder, Chartered Occupational Psychologist; Professor Colin MacKay, Principal Psychologist; Matthew Thomas, Manager of HR Strategy & Policy at Ernst & Young; and Amanda Hinkley of Winchester & Eastleigh Healthcare NHS Trust. Throughout the day delegates had the opportunity to take part in a number of workshops including ‘Developing Resilience in Managers’ and ‘Personal Wellbeing and Energy’.